We’ve already looked back at the top five news stories from off the felt and now we remember the five best heaters that players enjoyed in 2017. Poker players dream of making multiple deep runs in a row but only a few actually turn it into reality. In 2017, there were a few players whose heaters stood out above the rest and were paid handsomely for their rapid success. Heaters come in all forms and Nadar Kakhmazov’s run to over $1 million in earnings from two tournament wins in a matter of three weeks was astonishing. Kakhmazov conquered two casinos and two distinct fields to win his respective tournaments with the Venetian and Rio giving him massive payouts. The $1,100 Mid-States Poker Tour event at the Venetian drew 3,273 runners, easily eclipsing the $2.5 million guarantee. Kakhmazov beat a final table that included former November Niner Jacob Balsiger and East Coast grinder Je Wook Oh to claim the $440,029 first place winnings. He was far from done after that win as Kakhmazov made it to another high profile final table. The $5,000 Six Max event at the World Series of Poker is a top-tier event by any metric and held to form this year. Chris Hunichen, Sam Soverel, and Faraz Jaka were among the final tablists but none could solve the Kakhmazov riddle. Kakhmazov defeated Hunichen heads up to win the bracelet and $580,338 first place prize. Since his wins, Kakhmazov has yet to record any tournament cashes. Who knows when the Russian will show up next but when he does, he will have a lot to live up to in order to repeat his summer 2017 run. In the spirit of summer runs, Nipun Java deserves credit for winning two bracelets at the WSOP and then taking his talents to South Beach. Java and his native India won their first two bracelets in the $1,000 Tag Team event when Java and countryman Aditya Sushant shipped the title. Following the win, Java put together a string of three more cashes before striking gold again. Playing under the screen name ‘Javatinii,’ Java won the $1,000 WSOP Online Championship event for $237,688. In a matter of only 14 hours, Java defeated a field of 1,312 and added a second piece of hardware to his Las Vegas trip. It wasn’t over quite yet for Java, who traveled to Hollywood, FL for the Seminole Hard Rock Poker Open. In the $570 $1 million guaranteed opener, Java outlasted 3,173 entrants to take first place in a four-way deal and add $230,848 to his growing bankroll. Java’s wins catapulted him into must-watch territory for all events as he looks to build on his breakout campaign in 2018. If not for the dollar figure won by places #1 and #2, Art Papazyan would have a major case of being #1 on this list. Not only did Papazyan win two consecutive played World Poker Tour events, he did so in the first two WPT events he ever entered. Papazyan was mostly known by Los Angeles grinders and fans of ‘Live at the Bike’ for his high stakes cash game skills but that changed for Papazyan in a hurry. In his hometown, Papazyan beat Phil Hellmuth heads up to win Legends of Poker for $668,692 and put his name on the tip of every poker fan’s tongue. Not a tournament grinder in any respect, Papazyan opted not to play the Borgata Poker Open Main Event in September but made up for lost time at WPT Maryland. In a field of 561, Papazyan was among many notable faces who made Day 2 and the money, with Darren Elias, Matt Glantz, and Christian Harder included. As the field narrowed down on Day 3 near the final table, it became clear that Papazyan was the dominant storyline. Coming into the final table of six sitting third in chips, Papazyan quickly ascended into the chip lead and never looked back on his way to his second victory of Season XVI. Papazyan is still an unknown quantity to some but his natural poker skill is not to be taken lightly as he attempts to close out the WPT season as Player of the Year. In a year that turned Bryn Kenney into a living legend, he had to start somewhere and that was the PokerStars Championship Bahamas. Kenney put on a display that no other player matched in a single series as he cashed six times, reached a final table in every time he made the money and won two tournaments. In total, Kenney racked up $1.76 million in winnings in the Bahamas. That number set Kenney up for a year where he finished as the highest earning player of 2017 with tournament earnings of $8.5 million. The events Kenney played were against the world’s toughest competition and he beat a $50,000 final table that included a top four finishers of Mustapha Kanit, Byron Kaverman and Dan Colman. If there was ever a question about Kenney’s consistency, he put all to rest over the course of fewer than two weeks in paradise. 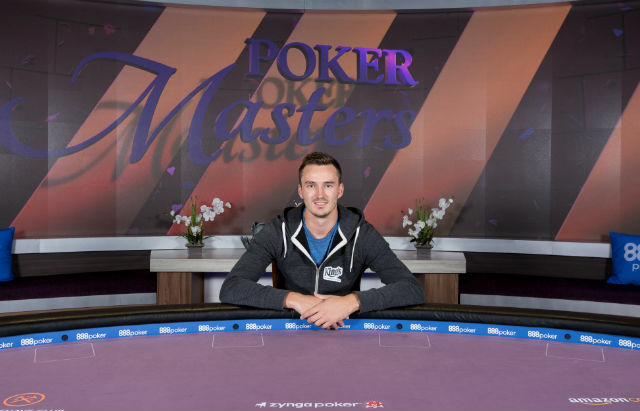 On one of poker’s richest stages, no player put on a better show over the course of the Poker Masters series than Steffen Sontheimer. The breakout year of “Goose” hit a peak for a week in September when he steamrolled over the best No Limit tournament players in the world to win the first Purple Jacket. Sontheimer cashed in four of the five events in the series and won two of them for a total of $2.73 million added to his account. He may have run hot but Sontheimer’s play stole the attention of viewers and his opponents, who were never able to get a firm edge on Sontheimer. Heading into the $100,000 Poker Masters Main Event, Sontheimer had the title all but locked up and decided to win that one just for kicks. Out of the six who cashed in the final, four were German and included Fedor Holz. Sontheimer’s beasting of the best players in the world put an exclamation point on a year dominated by Germans and forced, of all people, Daniel Negreanu to reevaluate his own game moving forward. Now that he’s a name brand of his own entity, Sontheimer will have a target on his back when 2018 gets started. When the Big One For One Drop returns to the WSOP schedule next year, Sontheimer will be in the field with nothing but another one of the most prestigious titles in poker in his sights.